NEW YORK (AP) The Los Angeles Lakers have been fined $50,000 for violating the NBA’s tampering rule again. League officials made the announcement Tuesday in response to an interview team president Earvin ”Magic” Johnson did with ESPN. 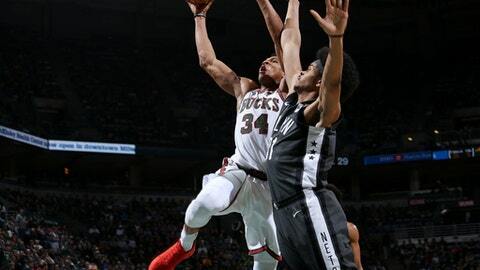 Johnson was discussing the skills of Milwaukee star Giannis Antetokounmpo and said the Greek native would put the Bucks ”on the map” and bring them an NBA title. It’s the third time in less than 12 months the Lakers have been disciplined for tampering. The team was fined $500,000 last summer after the league found general manager Rob Pelinka had been communicating with Paul George’s agent while George was with the Indiana Pacers. Previously, the NBA issued a warning to the team after Johnson winked at George during a television interview.